In some multiverse there is a disk-like world called Byteria. It is home to many different people and bizarre creatures. Our story takes place in Súramir, a large continent that is populated by a variety of races who have by now come to tolerate each other for the most part. It is the year 9992 Lyr, in an ancient elven calendar that the humans adopted for some reason. Somewhere near the northeastern shore lies a town called Ashford, capital of a small kingdom of the same name. 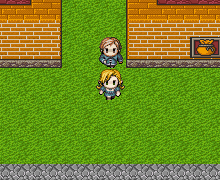 Heroine Iysayana is a story-based role-playing game with traditional mechanics. In a top-down perspective you travel the lands, talk to other people, visit stores, explore caves and dungeons and collect treasures. More playable heroes join Iysayana over the course of her adventure, with varying fighting and spellcasting abilities. Whenever the party runs into villains and monsters the game will switch to battle mode, where you give your characters orders in a classical turn-based system. Defeat your foes and earn experience and money. Combat experience allows the heroes to grow stronger and learn new spells. There is various magic to attack enemies, but also to heal or strengthen your characters. But remember that spells consume energy which may eventually run out. Look for treasure chests and go shopping to obtain items you can use to restore health and magic, along with better weapons and armor. And talk to the townsfolk to gather more or less useful information. The game can be played with the keyboard or a joystick and comes with detailed instructions. You can save and load your progress at any location in the game. Heroine Iysayana consists of three parts, and we strongly recommend to play them in order – everything else would just spoil the adventure. The complete adventures in one package. Already have version 1.5 (English Trilogy) installed? Use this file to update it.